Camp Hadar will provide transportation for ALL 8 weeks of the summer. Transportation Fee: There will be a small transportation surcharge $30.00 per child per week for all bus stops. Bus stop locations are subject to change based on camper enrollment. Pick up times will be between 8:00 and 8:30 A.M. and drop off times between 4:30 and 5:00 P.M. Exact times may vary according to the proximity to the camp and are subject to change prior to the first day of camp. Please be at the assigned bus stop at least 5 minutes before the pick up/drop off time. You will receive specific information about your child’s transportation about a week before camp begins. 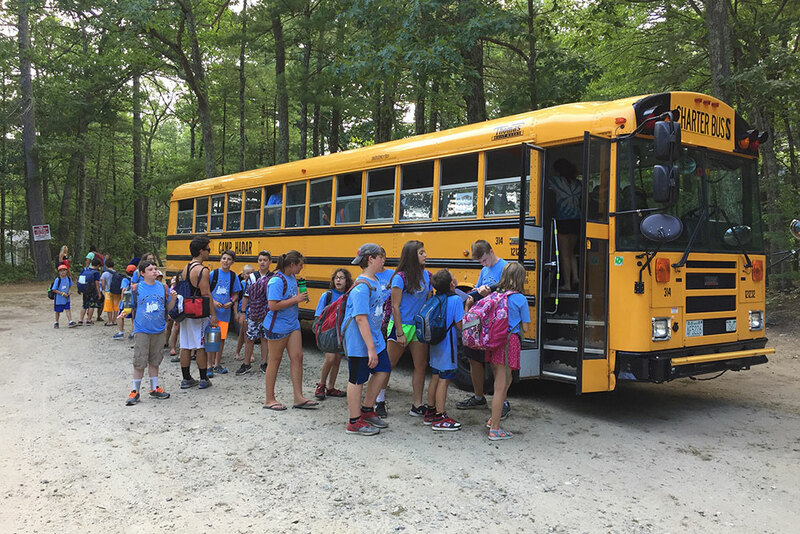 Chelmsford and Andover Bus Stops: If your child is not going to camp, please email redbus@camphadar.org by 7:30 am. Any problems or questions about the bus should be directed to the camp office, not the bus counselor. Please Note: Camp Hadar reserves the right to alter bus routes and times as needed. Camper enrollment will determine the schedule we follow each week. We appreciate your support in helping us to keep Camp Hadar affordable and providing a quality day camp experience for all our campers.